SET OUT TO SOLVE YOUR SLEEP - WITH NOTHING TO WEAR! Learn about your sleep patterns, connect your daily habits to your sleep quality to make good sleep a habit. - Just place the unnoticeable Beddit 3 Sleep Monitor on your mattress under your bedsheet and go to sleep - no gadgets to wear, no buttons to push. - In the morning you’ll get uniquely comprehensive and accurate results, which you can follow over time with long-term trend views to mark your progress. - Tag and follow daily activities and connect them to nighttime results so you can make make changes and see results. It’s the only system designed to solve sleep, not just track it! 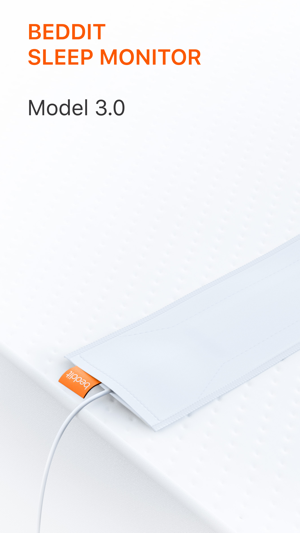 - Nothing to wear: Just place the soft, thin, mattress-gripping sensor under the bedsheet, plug the sensor into an outlet, and sleep naturally. Unlike standalone apps and wearable sleep Monitors, there’s nothing to remember wearing, pushing, or charging, and no clunky gadgets cluttering your night stand. Nothing to distract you from sleeping! - Automatic measurement: Measure sleep without pushing any buttons. After positioning the sensor and setting up the app, sleep sessions are triggered by just lying on the sensor. - Smart Alarm: Wake up refreshed from a light stage of sleep. - Notes: Tag and follow your daily activities to see how they relate to your sleep quality. Score your sleep each morning and keep track of the way you feel you slept matches up with your sleep results. Connecting your subjective feelings to your objective data, and get the real picture! - Trends: Follow your sleep results and track your progress long-term with 7, 30 & 90 day trend views. - Notes in Trends: See which activities are most related to good and bad sleep over 7, 30, 90 day views. 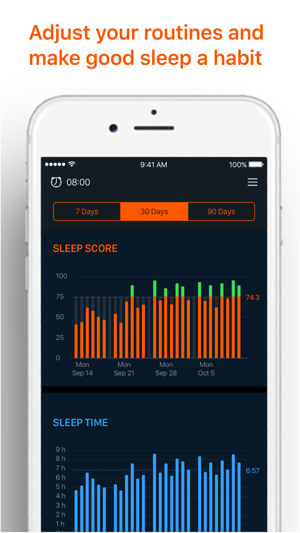 Take your Sleep Scores with you on the go and drill down into the details of your previous night using the Digital Crown. 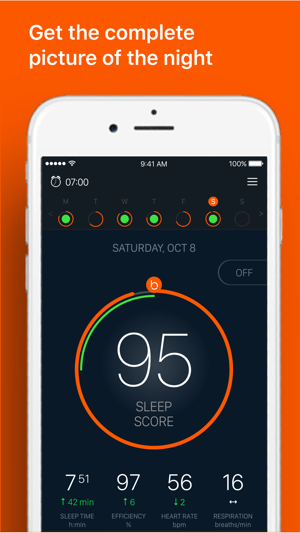 Nap to recharge and boost your previous night’s SleepScore. 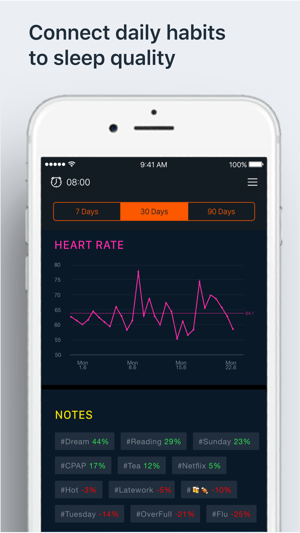 Beddit Sleep Monitor integrates with the Apple Health app to record your heart-rate, respiratory and sleep analysis data from Beddit app into the Health app. * Snoring detection requires you to grant access for Beddit to use the microphone on your iOS-device. Beddit does not record audio (e.g. speech) but only fluctuations in noise levels. ** Smart-measuring functionality requires you to authorize Beddit to use location services on your iOS-device. 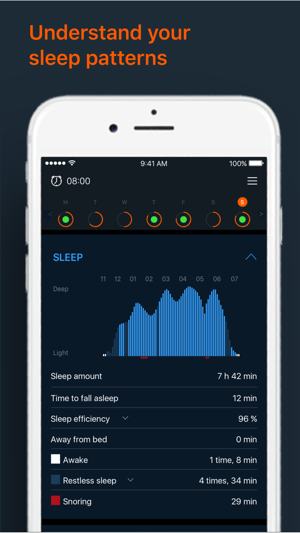 Smart measurement is based on iBeacon, and used only to initiate sleep sessions upon going to bed. Continued use of GPS running in the background can decrease battery life. The way it presents the info is also easy to understand, and provides a quick nice overview! So yes, I recommend beddit! Geeft mij een mooi inzicht in mijn slaapgedrag dmv duidelijke grafieken. Smart alarm functie is super. Does not correctly register if I am awake, instead registers al bed time as sleep time. Furthermore, poor data analysis. Have had better app based monitors (not using additional sensor). Disappointed.